The principles and practices of Classical Athenian democracy provide a valuable starting point for designing a modern democracy, which can be scaled to any size. The model presented here fulfills the Athenian principles of political equality (isonomia) and the freedom to speak and contribute to the democratic decision-making process (isegoria). It capitalizes on the Athenian practice of using multiple representative bodies, selected by lot, providing a system of checks and balances. Finally, this model resolves the five dilemmas of conflicting objectives, discussed above (see Table 1.). 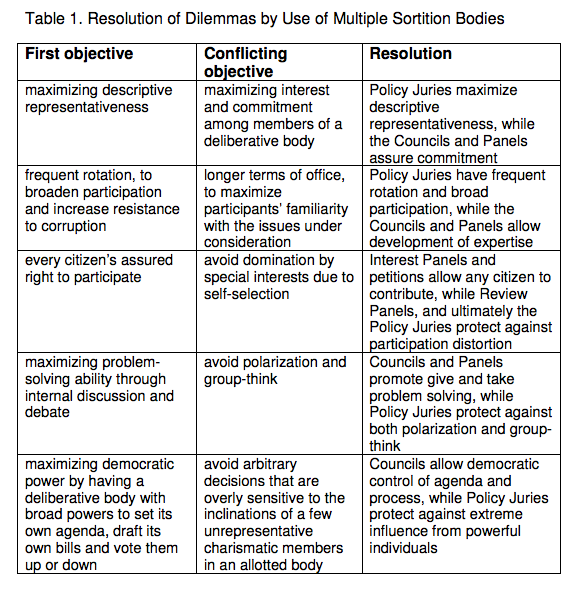 This sortition model is scalable from a municipal to state, national, or international level. The areas of jurisdiction are endlessly flexible, from relatively minor decisions up to and including all legislative tasks, to the exclusion of elections entirely. Obviously it is both practical and prudent to start at a small scale, and with a narrow mandate. Thus an initial focus on municipal adoptions makes sense, as happened with Canada Bay in New South Wales, Australia in 2012 (Thompson 2012). Situations where existing elected officials are reluctant to make unpopular (political no-win) policy decisions, and might be willing to transfer them to allotted citizen bodies, are especially plausible for early adoption. 1. Deal with one law – as with the British Columbia Citizens’ Assembly. 2. Make all laws within one issue area – for example, an area where legislators have a conflict of interest, such as redistricting or ethics rules enforcement. 3. Enhance the deliberative quality of an initiative and referendum process (Gastil 2012) – for example, as in the Oregon Initiative Review process. 4. Replace one elected house of a bicameral legislature. 5. Carry out the entire legislative process in place of an elected legislature. It is my hope that this “reference design” can serve as a conceptual base for the development of concrete proposals, which may retain an elected legislative chamber and are thus more feasible to implement, but that benefit from many of the advantages of this model. One wonders what might have occurred if this competing vision of democracy had been widely known by Egyptians during the Arab Spring. The irony of leading democratic activist Dalia Ziada urging a boycott of an election, due to the lack of an acceptable candidate (Ziada 2012), drives home the limitations of the electoral model of democracy. Democracy might be better without elections.